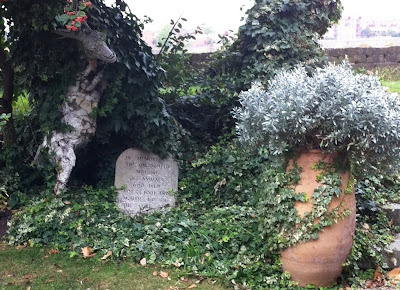 This strange memorial to the animals that died in the foot-and-mouth epidemic stands in a small private garden in Greenwich on the bank of the Thames. I'm not sure if the skeletal goat figure beside the tombstone is the remains of a real animal or just creepy art. Although one small grave hardly counts as a cemetery - let alone a city of the dead - I am posting it as part of my series of necropolis photos on my blog in the run-up to Halloween because it is right to remember all the animals that have suffered and died as well as humans. Animal graveyards and memorials are few and far between. This one is worthy of noticing. There's a Pet Cemetery in Hyde Park. It's difficult to see except from the top of a bus. There is a small animal cemetery in the park by my old primary school. It only consists of about 6 or 7 tombstones but i always thought it was brilliant that someone had cared enough about their pets to give thema proper burial. I could send you a photo for your necropolis collection if you like?